The Hassay Savage 66016 1/4" Hex Rotary Punch Broach requires a pushing action to cut a hexagonal-shaped hole in a component. It has an 8 mm shank and is made of M-2 high-speed steel for a balance of strength and toughness. It is designed for use with use with screw machines, CNC turning machines, or arbor presses and requires an arbor hole to be cut in the material before broaching. 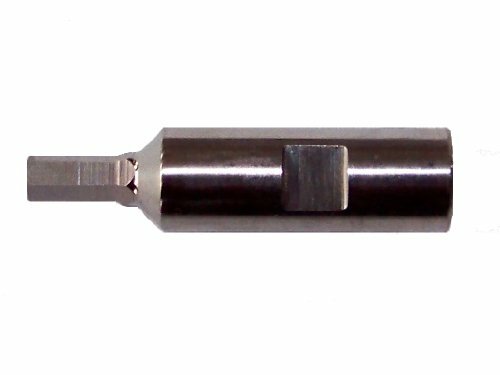 Broaches are cutting tools that can be pushed or pulled through a component to make key, square, hex, and other hole shapes. Most broach styles have teeth that increase slightly in cutting edge size and distance from each other to the end of the tool so they complete the full cutting process in one operation: roughing, semi-finishing, and finishing. Keyway broaches are specifically designed to make keyways. Rotary broaches, also known as wobble broaches, create shapes in blind holes. Hassay Savage manufactures broaching tools. The company, founded in 1969, is headquartered in Turners Falls, MA. If you have any questions about this product by Hassay Savage Co., contact us by completing and submitting the form below. If you are looking for a specif part number, please include it with your message.